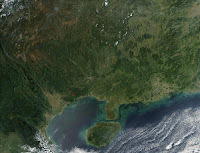 Some groups have estimated that China's middle class will be larger than the total population of the United States by 2010. I think that over the next 5-7 years there will be an explosion of capital out of China investing in US hedge funds and in turn an even stronger showing of Chinese hedge funds. As their capital markets become stronger and more mature the average person in China is saving 15% more of what they earn every year. Equities have been on a rally increasing almost 75% so far in 2007 but eventually the market will be mature enough and equities growth outlook choppy enough that diversification into alternative assets will become more important. If you are a hedge fund there may be opportunities to sell and market your products through Chinese-based but American owned banks or financial networks. The WSJ reports that in 2006 there were over 60 hedge funds currently investing in China and according to Eurekahedge this makes up over $4B in assets. The US-China Business Council has more information on statistics related to Chinese hedge funds and investors in China.